Posted by Colin Hansen on Thursday, December 13, 2018 in News. Colin B. Hansen, Vishwesh Nath, Allison E. Hainline, Kurt G. Schilling, Prasanna Parvathaneni, Roza G. Bayrak, Justin A. Blaber, Okan Irfanoglu, Carlo Pierpaoli, Adam W. Anderson, Baxter P. Rogers, Bennett A. Landman. “Characterization and Correlation of Signal Drift in Diffusion Weighted MRI”. Magnetic Resonance Imaging (2018). Diffusion weighted MRI (DWMRI) and the myriad of analysis approaches (from tensors to spherical harmonics and brain tractography to body multi-compartment models) depend on accurate quantification of the apparent diffusion coefficient (ADC). Signal drift during imaging (e.g., due to b0 drift associated with heating) can cause systematic non-linearities that manifest as ADC changes if not corrected. Herein, we present a case study on two phantoms on one scanner. Different scan protocols exhibit different degrees of drift during similar scans and may be sensitive to the order of scans within an exam. Vos et al. recently reviewed the effects of signal drift in DWMRI acquisitions and proposed a temporal model for correction. We propose a novel spatial-temporal model to correct for higher order aspects of the signal drift and derive a statistically robust variant. We evaluate the Vos model and propose a method using two phantoms that mimic the ADC of the relevant brain tissue (0.36-2.2 x 10-3 mm2/s) on a single 3T scanner. The phantoms are (1) a spherical isotropic sphere consisting of a single concentration of polyvinylpyrrolidone (PVP) and (2) an ice-water phantom with 13 vials of varying PVP concentrations. 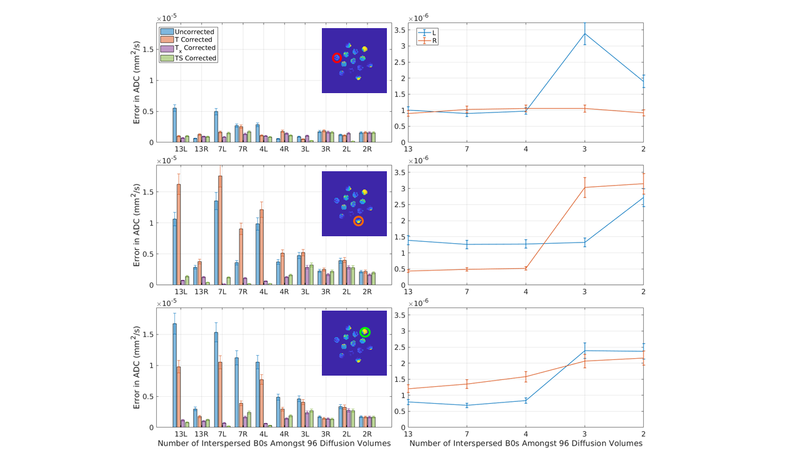 To characterize the impact of interspersed minimally weighted volumes (“b0’s”), image volumes with b-value equal to 0.1 s/mm2 are interspersed every 8, 16, 32, 48, and 96 diffusion weighted volumes in different trials. Signal drift is found to have spatially varying effects that are not accounted for with temporal-only models. The novel model captures drift more accurately (i.e., reduces the overall change per-voxel over the course of a scan) and results in more consistent ADC metrics. This plot presents the average error in ADC (standard deviation in a 3rd degree polynomial fit to the mean ADC of an ROI over the course of a scan) after correction for each of the five methods for 10 consecutive sessions using the ice water phantom with varying numbers of interspersed minimally weighted (“b0”) volumes (labeled in the x-axis). The appended letter of the x-axis label indicates the phase encoding direction (L = rll R= rlr). The three rows correspond to the three ROI’s in Figure 1, as indicated. The left column presents a comparison of the five methods. In the low variance ROI (first row), overall errors are small and little difference is observed between methods. In the two ROIs of higher variance, Tx, and TS outperform T for all scans. Note that in some scans, the uncorrected method out performs the T corrected scans. The right column studies simulated rate of b0 volumes by dropping out the b0s from the first two scans. Observe that with at least 4 b0s, the model errors are stable and low, which is intuitive as a second degree model is fit for #b0s>3 and a first degree model is fit for #b0<=3.